1. What is the basic information that needs to be furnished in Form GSTR-1? iv) supplies to resellers (B2B) – specified invoice wise details. 2. What if a trader/businessman is unable to undertake compliances under GST himself? Ans. Under GST, the government will allow qualified persons to act as GST Practitioners. In case the trader is unable to undertake compliances himself, he can utilize the services of such GST practitioners to do the compliances for him.There would also be Facilitation Centres, Help Desks in each GST Commissionerate. There would also be facility of GST Suvidha Providers (GSPs) who would be developing software for uploading data onto the GSTN portal. 3. How will aggregate turnover be computed for the purpose of composition? Ans. It will be computed on the basis of turnover on all India basis. 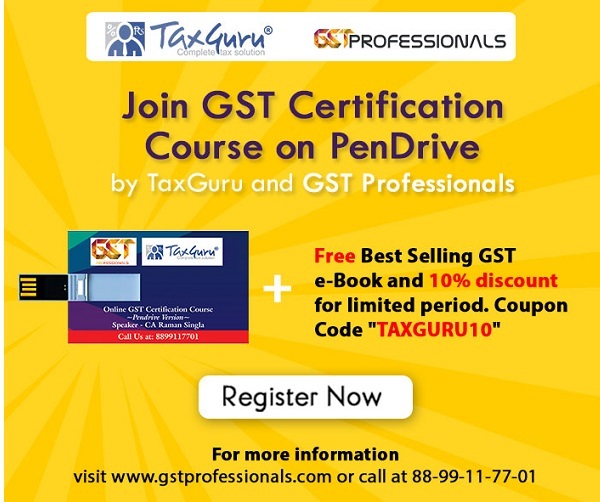 “Aggregate turnover” means the aggregate value of all taxable supplies (excluding the value of inward supplies on which tax is payable by the composition dealer on reverse charge basis), exempt supplies, exports of goods or services or both and inter-State supplies of persons having the same Permanent Account Number, to be computed on all India basis but excludes central tax, State tax, Union territory tax, integrated tax and compensation cess. 4. What is the basic information that need to be furnished in Form GSTR 4? Ans. It should contain details of turnover in the State or Union territory, inward supplies of goods or services or both, tax payable on reverse charge basis in case of purchases made from unregistered persons and tax payable. 5. Will the compliance process under GST be complicated for traders under GST? What measures have been put in place to ease burden of compliance on small traders? Ans. No. The compliance process will be automated and easy for traders. The following steps have been taken by the Government in this regard. a) Small traders with a turnover below Rs.20 Lakhs need not register under GST. b) An easy to understand and comply composition scheme for traders having turnover upto Rs. 75 lakhs where tax can be paid quarterly as a percentage of turnover. c) GST Seva Kendras have been opened in all Commisssionerates (upto Range office) under CBEC to help small traders under the GST law and process. d) For uploading of invoice details, GST Network will be providing easy to use application free of cost which will enable hassle free uploading of invoices by traders. e) The returns and payment of tax process under GST is completely online. There will be minimal interface or no interface with the tax authorities. f) Small taxpayers can use the services of GST practitioners at a nominal cost to take care of their compliances under GST. g) GST Suvidha providers (GSPs) will be providing easy to use applications which will provide an interface with the GST network for easy and smooth compliances under GST. h) Strict time lines have been prescribed which shall be adhered to by all proper officers. Registration will be given in 3 working days if the documents are in order. In case no response in received from the proper officer within 3 days, registration shall be deemed to be granted. i) Application for refund will be completely online with minimal interface with the tax officer. Acknowledgment of refund claim will be given in 15 days and the claim will be processed in 60 days failing which interest will be paid. For Exports, provisional refund up to 90% of the claim will be sanctioned upfront without any verification. The amount of refund will be directly credited to beneficiary’s bank account. 6. The traders are not used to classify the goods under the HSN nomenclature and are likely to face hardship in this regard? Ans. Taxpayers whose turnover is above Rs.1.5 crores but below Rs. 5 crores shall use 2-digit code and the taxpayers whose turnover is Rs. 5 crores and above shall use 4-digit code. Taxpayers whose turnover is below Rs. 1.5 crores are not required to mention HSN Code in their invoices. Further the goods emanate either from manufacture or from imports. The traders usually don’t change the nature of goods. The classification, in general, will be in continuity from the HSN declared by the manufacturer or importer both of whom have been using the system in the past also.